In the Ink Dark is a new project from artist Luke Pell and collaborators. Throughout May and June a series of conversations and encounters with different people in Leith and Edinburgh will lead to a week of live dance performances at unique spaces across the city including Central Library and McDonald Road Library. Performed by an eclectic group of dance and performance artists with an original music composition from Scott Twynholm, In the Ink Dark collects and explores experiences of loss and landscape, memory and materiality through dance, design and poetry. Staff from Edinburgh University Library will take you on an online guided tour of its collections, featuring highlights from the Art Collection and introduction to the Wellcome Trust-funded project `Towards Dolly: Edinburgh, Roslin and the Birth of Modern Genetics’. You will also hear about new initiatives to open up the Library’s digital collections and get a chance to try out their new metadata image tagging game! 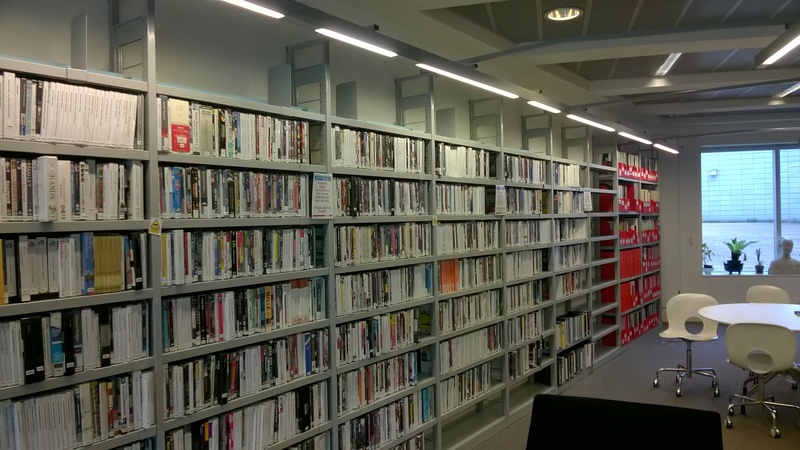 On Tuesday 2nd June I went on a visit to Edinburgh College of Art Library which was one of the programme of visits organised by ELISA training and development group. The College of Art is on Lady Lawson Street in Edinburgh Old Town and has an old building at the front and a new building at the back leading onto West Port. The library is in the new part of the building. The librarian, Jane Furness, had kindly offered to show us around and give a talk about the library and how it is used. The library is based on 3 floors although as we were vising at the same time as the degree show was on, the top floor was being used for the exhibition. Each floor is separate as it was originally going to be an office building so you come out of each floor and use the lift or stairs to get to the next. On the main entrance floor is the Help Desk / Service Desk, some PCs and printer, lots of journals and magazines, the short loan collection and a collection of DVDs. There is a variety of seating – comfortable seating and seating at tables and chairs. 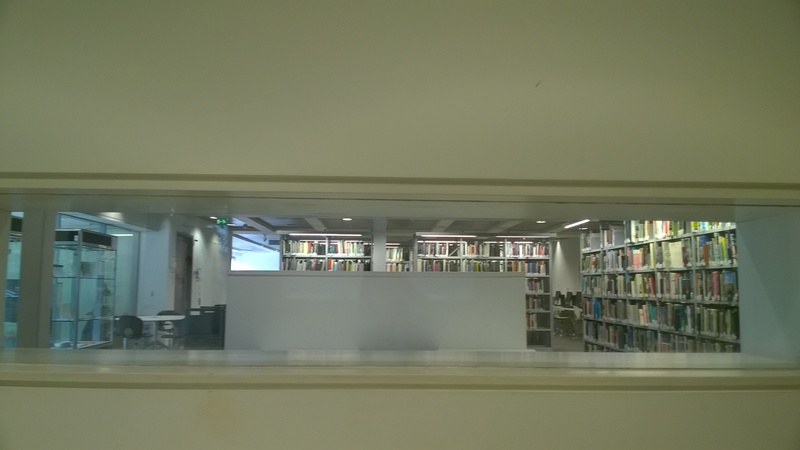 On the lower floor there is the main book collection and some desks with PCs. The whole area is light and bright and has a good feel to it. It feels like a good place to work and the book collection is very interesting. Jane explained about the collection and about the links with other Edinburgh University libraries and how the students use the resources. Although there are some electronic resources, due to the nature of the subject it is important to have paper based books and artifacts that are accessible and appealing. 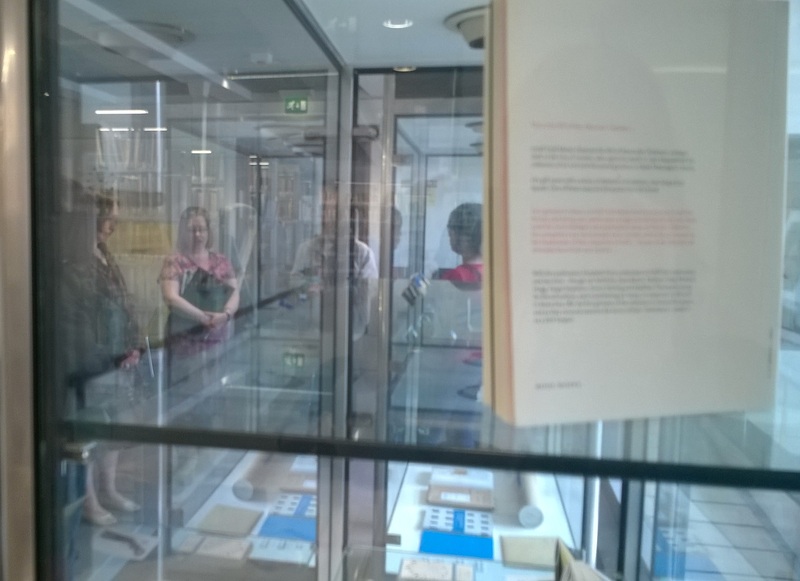 There are display cases containing exhibits and artists stories – these are really interesting and give an insight into the character of the library and its users. The material is unique to the place. 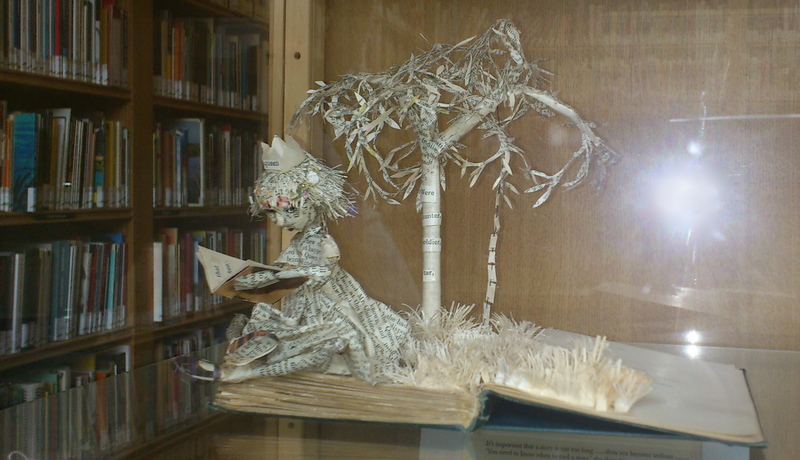 More information about the ECA Library can be found on the University of Edinburgh website. After we had looked around the library, we visited the rest of the building and the degree show. there were some interesting exhibits and a great view from the top. To mark the anniversary of the Massacre of Glencoe NLS will be screening an innovative video celebrating one of Sir Walter Scott’s lesser-known works. Scott’s poem ‘On the Massacre of Glencoe’ commemorates one of the darkest incidents in Scottish history – the Massacre of Glencoe which saw more than 70 Highlanders killed for alleged treason. 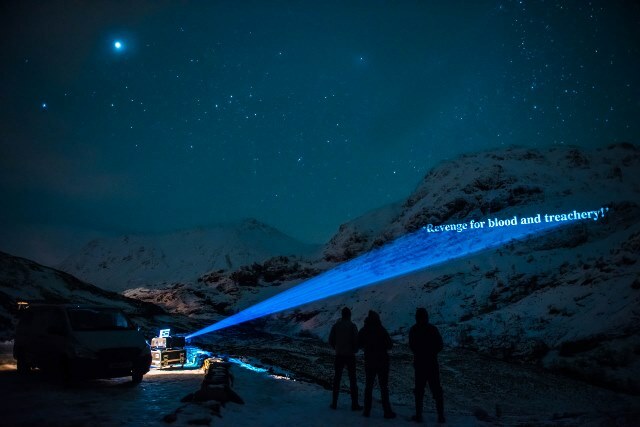 An Edinburgh-based company Double Take Projections has created a video showing the words of Sir Walter Scott’s poem, being beamed, on location onto the Glencoe scenery. I’ve been fascinated by this story since the beginning and made several trips round Edinburgh (and elsewhere in Scotland) to see these wonderful pieces with my own eyes.